Thread: Odd looking teddy, looks a bit like an ant-1970s? He has an oval head, white plastic eyes with black pupils, when Dad bought him second hand his eyes had become complete white and I repainted them years later....He has two ears on the top of his head that are long like antenae. He has a brownish fur head + face and torso, his paws stick out at at his sides and are of a lighter brown material as are his long legs with the darker brown matching his face/head on the tips of his feet. 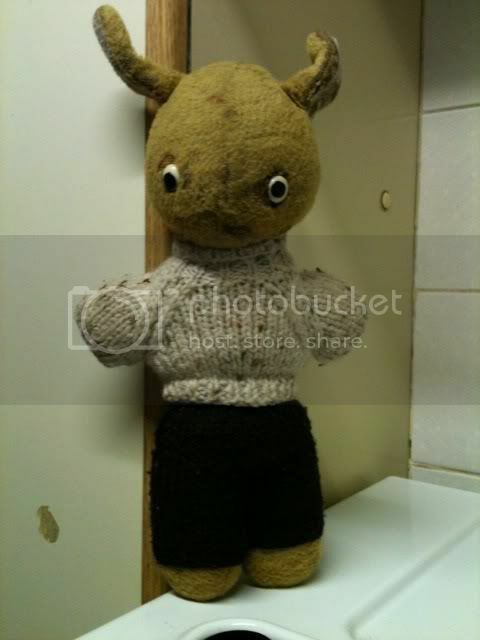 Re: Odd looking teddy, looks a bit like an ant-1970s? Will try and get a pic sorted, will have to borrow a neighbours camera for that so bear with me. Until then, maybe a member will recall my odd little 'alien' teddy...? Hope so, would be nice to see if I can buy another one. I took him to a Teddy Bear collector/dealer in Godalming once called The Bear Garden and even he'd never seen one like this before...real curio isn't he? But he is adorable nonetheless. Was there a "cuddly" toy version of Donnie Darko in the late '60's? What an odd looking teddy.Teddy?. Think I may of seen something similar years ago,but not quite sure possibly at a vintage toy stall at Bath antique market,either that or a shop in Frome that deals in vintage and old stuff. My first thought was that it could of been home made possibly using one of those kits with the ring clip eyes,but your original post counts that one out.I just have a strange feeling perhaps your teddy could be a bunny instead.